Almost all cancer treatments today are a result of the research conducted in clinical trials. For this reason, clinical trials are critically important in the development of new multiple myeloma treatments and in helping doctors and researchers develop a better understanding of the biology of the disease. For many people with multiple myeloma, participation in a clinical trial may be a good option for treatment. Be sure to talk with your doctor about which clinical trials are available and whether one of them may be right for you. Interested in participating in a clinical trial? Talk to a Multiple Myeloma Research Foundation (MMRF) Patient Support Nurse to learn more, or use our clinical trials finder. Chimeric antigen receptor T-cell (CAR-T) therapy involves collecting immune cells called T cells from the patient’s own blood and genetically reprogramming them so they recognize and target a particular antigen on cancer cells. The reprogrammed CAR T cells are expanded by growing cells in a lab and are then infused back into the patient’s body, where they can attack and kill cancer cells. CAR-T therapies have recently been approved to treat some other cancers, but they are still being investigated in clinical trials for multiple myeloma. Results reported for these trials so far have been promising, with many patients with relapsed or refractory disease achieving long-term remission. Another experimental approach to engineering T cells in multiple myeloma uses transduced T-cell receptors. This involves introducing a T-cell receptor that recognizes a particular tumor antigen to the patient’s immune system. Vaccines in development for multiple myeloma work by injecting either cancer cells or proteins expressed in cancer cells into the patient’s body. This activates the immune system against the cancer proteins in the vaccine, stimulating T cells to kill foreign invader cells—which include cancer cells within the body as well as the injected material. Several studies are under way to explore new and better ways of combining certain proteasome inhibitors (PIs) and/or immunomodulatory drugs (IMiDs) with other multiple myeloma therapies. New drugs and drug combinations that target specific proteins found on cancerous cells are currently being studied in clinical trials. These include a combination that inhibits the interaction between MDM2 and the tumor suppressor p53 for patients with relapsed multiple myeloma who have a chromosomal abnormality known as 17p deletion, a combination of a BRAF inhibitor and a MEK inhibitor for patients who have a genetic mutation known as BRAF V600E, and a pan-FGFR tyrosine kinase inhibitor for patients with a mutation of the FGFR3 gene. 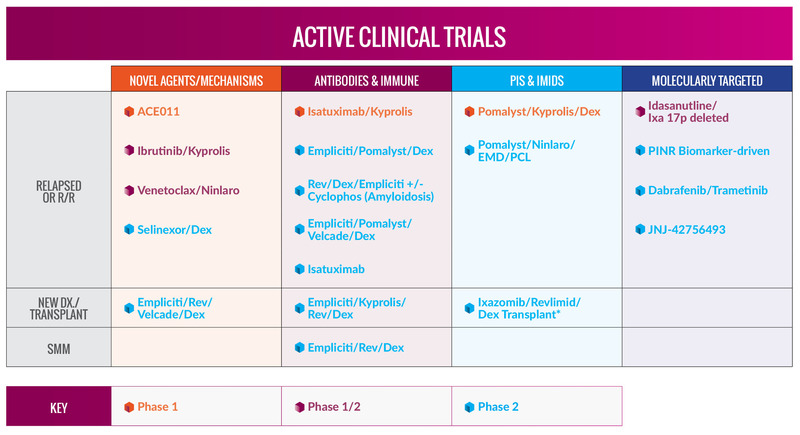 Other new and emerging therapies with novel mechanisms of action currently being investigated include treatments for anemia and bone loss to potentially increase hemoglobin, hematocrit, and red blood cell counts in patients with myeloma, combinations of the proteasome inhibitor Kyprolis with a BTK or JAK1/2 inhibitor, combinations of the SINE Selinexor with a steroid or a proteasome inhibitor, and a combination of the BCL2 inhibitor venetoclax and a proteasome inhibitor. You can learn more about experimental treatments in multiple myeloma here.